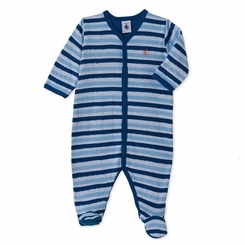 Crafted in tube knit, this baby boys' sleepsuit features stripes that contrast with the solid soles of the feet. Note the snapped Y-shaped opening for practical daily wear. An adorable baby boys' sleepsuit perfect for baby's first wardrobe. Material: 100% Cotton.